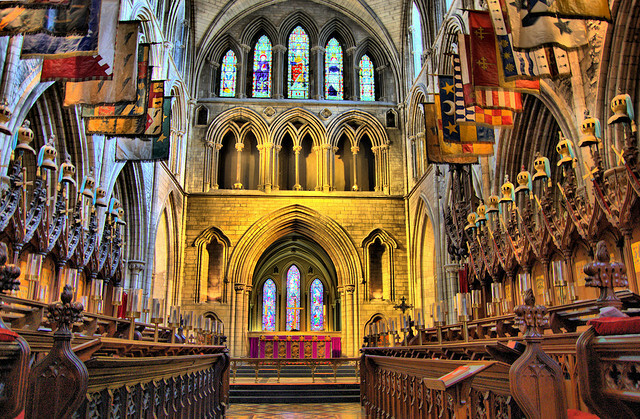 The Lady Chapel in St Patrick’s Cathedral in Dublin has been re-opened following a €700,000 conservation and cleaning project. Built in 1270, the Lady Chapel is one of the oldest sections of the historic Cathedral. It is now open throughout the day and the Dean and Chapter of St Patrick’s have said they are delighted that such a beautiful and historic space is open again for both visitors and pilgrims alike to enjoy. Minister for Arts, Heritage and Gaeltacht, Jimmy Deenihan, who was at the official re-opening, said it would be a significant addition to Dublin’s attractiveness to visitors. “We can already see how the restoration of this unique space has rejuvenated interest in the Cathedral as a whole,” Dean Victor Stacey said on Monday. “From an aesthetic point of view, it demonstrates how careful restoration can illuminate the architecture and craftsmanship that make the Cathedral one of the most beautiful in this part of Europe,” he said. In September 2012, the Lady Chapel was closed for the extensive cleaning of all its stonework, monuments, stained glass and floor tiles. Irish craftsmen and women worked on the project, which also involved the installation of a new lighting scheme and the repainting of the ceiling. New communion tables and seating were designed by an Irish manufacturer. All the work has been funded through income generated by visitors to the Cathedral and through the fundraising efforts of Friends of the Cathedral. 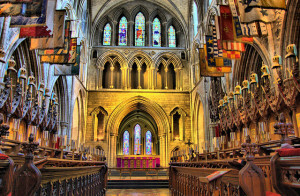 The history of St Patrick’s puts it among the great cathedrals of Northern Europe which in the 13th and 14th centuries had a chapel behind the high altar dedicated to the Blessed Virgin Mary. Built in 1270 by Archbishop Fulk de Saunford, the Lady Chapel like the rest of Saint Patrick’s Cathedral was restored in the 19th century. From the mid 17th century to the early 19th century, the Chapel was known as the ‘French Chapel’ as it was used by Huguenots (French Protestant refugees) after they came to Ireland following the revocation of the Edict of Nantes. One of these Huguenots, Dr Elie Bouhereau, was the first librarian of Marsh’s Library, and is buried in St Patrick’s. There are records of many internments beneath the floor of the Chapel. Other chapels either side are dedicated to St Peter on the north side, and St Stephen on the south side. Objects of interest in the Lady Chapel and the side chapels include a chair which is said to have been used by King William III at a service of celebration after his victory at the Battle of the Boyne. The window inside the gate of the south choir aisle commemorates Annie Lee Plunkett, wife of Archbishop Plunkett, and daughter of Benjamin Lee Guinness. She was renowned for her charitable work, and is remembered here with a very appropriate sciptural quote for her family: ‘I was thirsty and ye gave me drink’. The Lady Chapel now serves as a private chapel space and the majority of the Cathedral’s midweek services take place there. It is also used by St Patrick’s Education Department during term time and for choir rehearsals and recitals.